I recently returned to Dancing Rabbit for a week and a half, after spending some time with family, before heading out to a meditation retreat. It was just in time to fulfill my monthly clean team duties, to attend approximately eight meetings, and to write this column. It has also been just enough time to appreciate what I love about living at DR; but not quite enough time to do as many of those things as I would have liked. 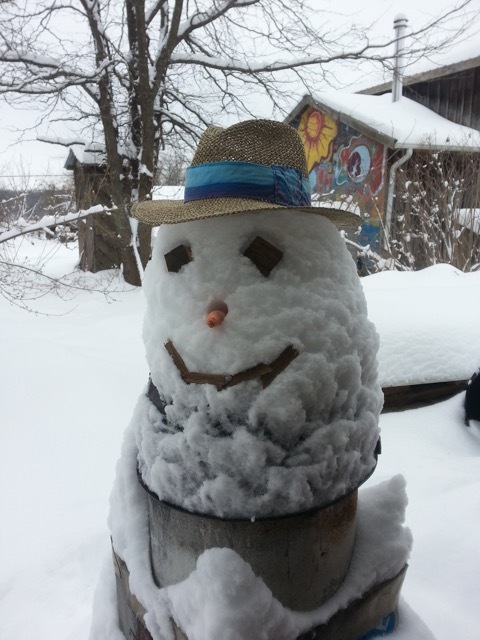 One of our newest community members, enjoying the weather. 1. Not having to get in a car for days on end. When my family and I were traveling to visit family in North Carolina, we spent a lot of time driving. Sure, I enjoyed the freedom of being able to go wherever I wanted, but being home now, I really appreciate time spent not waiting to get somewhere — or burning fossil fuels to go buy groceries. 2. Going outside multiple times a day. Since I don’t have everything I need in our house here, I am forced to go outside throughout the day. Sometimes, like during the recent snowstorm, that feels hard. But usually, I love it. I know that every minute I spend in nature I am slightly more sane (and probably slightly nicer to my family) so I really appreciate having the outdoors be such a big part of my life here. 4. Kids in and out all day, lots of pretend, and legos. One thing that I really missed while being away from home for a few weeks was the kids stopping by throughout the day to play. Yes, our homeschool day takes longer when we have a break every 35 minutes for lego time, and yes, I think there might be more mud in our mudroom than there is floor because of all the traffic, but it is so great not having to arrange playdates or drive across town in order for the kids to see friends; and I especially appreciate the time that they have throughout the day to process whatever it is we have been studying in school while playing. 5. Getting back to my morning routine of yoga and meditation. As much as I might try to keep up with my routine when we travel, I inevitably find reasons why I just can’t fit it in, so I have been glad to get back to it, if only for a week or so. Liz and I have been meditation buddies for over a year now, and she is the reason why I have been able to be so consistent with the meditation for so long. There have been many mornings that I have pulled myself out of bed simply because I know that she’ll be meditating alone if I don’t get there. 6. Art time on Friday. Katherine, Burl, and I have been taking turns hosting art time on Friday afternoons in the common house. It’s a time for folks of all ages hang out and be creative. Yes, there was more running in circles than was ideal for me, but it was so nice to doodle and chat for a while. 7. Going to bed early. There is something about life here that makes it really easy to go to bed early in the winter. It feels natural to sleep a lot when the nights are long, and I have found myself getting ready for bed by 7:30 at times. Of course, it will be balanced out by summer nights when we are still at the pond, chatting in the courtyard, or watering the garden at 9:00 pm, but right now, it feels great to get into my warm bed with a good book early on in the night. 8. Eating the food that we grew and then froze, stored, or dried for the winter. When were were traveling, I tried to fully appreciate having mangos, and as much fresh salad as I wanted, in December, but the truth is that food doesn’t taste as good as the Brussel sprouts I froze last October, or the nettles I dried last spring. I have been happy to rifle through the freezer or open new jars of tomato sauce, since we have been home. 9. Playing games about end-of-life decisions. On Tuesday after potluck, Sara hosted the Hello Game, which involves talking about what is important to you when it comes to death and end-of-life decisions. All day Tuesday I told myself that I was too tired to stay out after dinner, but when everyone gathered to play (and since the kids were happily playing with their friends in the kids’ room) I decided to stay. I learned that I have a few things I need to figure out. I also learned to appreciate my friends a little more, and I just love that I live somewhere that people are excited to play this kind of game. 10. Quiet nights with the stars. Every time I come home to the prairie, I am newly surprised at how vivid the stars are out here. The village is often pretty dark at night, with little nighttime lighting. When I am walking back from dinner or going outside to get water on a clear night, I am always a little taken aback by how beautiful the night sky can be. I’m heading out again on Wednesday, this time for 10 days, and I am already a little sad about what I’ll miss here. When I get back, it will be a whole new season. At Dancing Rabbit, late winter means time for our annual retreat, when we gather to spend a few days to discuss matters of import to the community, and it also means garden planning and gearing up for spring – but then I’ll have a whole new list of reasons why I love living here. Can you think of lots of reasons why you might like to live at Dancing Rabbit? If so, our visitor program could be a wonderful experience for you. You’ll sit in on a variety of workshops about ecological sustainability and living in community, enjoy some delicious homemade food, and get a chance to see the Milky Way while floating in our swimming pond. The program is filling up fast, so you might miss out on your opportunity to come this year if you don’t sign up now.